Auburn has had decent success against UT over the years. Compiling a head to head record of 74-32 with a 43-18 mark at home and 31-14 on the road. Last year the Vols were one of the few SEC teams that Auburn could take a series from (this was pre midseason collapse Auburn) and won 12-6 and 4-3 with a Saturday 4-8 loss (in 11 innings). I'm going to be blunt, as bad as Auburn was last year, UT was worse. Finishing behind Auburn in every statistical category last year and ending the season with a 12-18 SEC mark and 27-29 overall. The Vols got off to a rough start. Losing 4 out of their last 5 games and dropping head scratchers to teams like USC-Upstate and Austin Peay. After finally bouncing back with a 4 game sweep of Ohio and splitting a pair of midweek games with Louisville and WKU, the Vols come in with a 7-6 record. Statistically both clubs are similar and very close in most SEC rankings. All this isn't to say that UT isn't without talent. They've got a National Award Winner (1B Cody Hawn), 3 Baseball America Top 100 Prospects (OF Kentrail Davis, and Pitchers Bryan Morgado and Nick Hernandez) and two Preseason All Americans (Morgado and Davis). Morgado is a Freshman All-American and held down the role of Saturday starter. 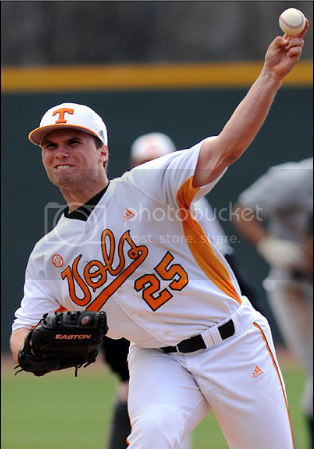 Making 13 starts last year (tied for team lead), his record wasn't sparking (5-5) but in his defense UT scored two runs or fewer in four of his starts. He was also one of the nation leaders in Strikeouts with 104 last season. This year he has a 1-0 record in 2 starts (4 appearances total). He already has 15 KOs in 12.1 Innings. To compare, Auburn has only 3 guys with equal or more KOs (Burnside, Jon Luke Jacobs, Grant Dayton) but each of them have done it in at least 2 more innings of work. The stud star of the team is Davis. Racking up a lot of preseason attention, Davis was a unanimous choice as Preseason All American from both Baseball America and Rivals (and a rare sophomore on a junior heavy squad). He was also named the Golden Spikes watch list and Wallace watch list. He's currently batting .318 with 3 HR and 17 Runs (team leader). The Tigers and Vols square off at 6:00pm (CST) Friday, 3 Saturday, and Noon Sunday.